Janus Vandal Proof Phones (VPP) offer a full duplex speaker emergency phone solution into the market for locations where security and easy access to emergency communication is paramount. 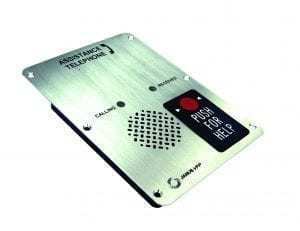 The product range includes vandal-resistant emergency telephones for elevators, both public indoor and outdoor areas such as transit, campus, hospitals, airports and parking garages. These phones need to be climate resistant for the harshest environments. The overall market of VPP has increased due to rising concern of safety especially on campuses and public areas. Development of technology has allowed for solutions such as remote monitoring systems, VOIP solutions and integration with other solutions such as mass notification and video surveillance systems. The key difference between analog and Voice over IP is the way that the voice signals are delivered. For the analog phone service, signals are carried over a copper wire which runs from a central switch office to many homes and businesses. An analog telephone system converts the voice signals into electronic signals and these electrical waves will travel over the telephone line and create two-way communication. The VOIP phone service delivers signals over an IP data network – typically the Internet. Comparing with analog telephone subscribers who receive a connection from their local phone company, VOIP converts analog phone signals into digital signals and runs the phone system on an IP network through your own IP address or the Internet, combining voice and data on one secure network. The VOIP communication method is cost-effective and easy to use. It offers a secure and high-quality service by managing calls over private networks. It also offers more features than a traditional analog phone such as voicemail, caller ID, Internet faxing, virtual receptionists, advanced call screening and forwarding, integrated office software, and voicemail forwarding to a personal email or cell phone. Advanced technology has even provided access to hosting web and video conferences with VOIP. There are three transmission modes: simplex, half duplex, and full duplex. The transmission mode describes the direction, or flow of signal between the two connected devices. In simplex mode of transmission, the communication is unidirectional; in the half-duplex mode of transmission, the communication is two directional, but the channel is alternately used by both connected devices; in the full duplex mode of transmission, the communication is bi-directional, and the channel is used by both the connected device simultaneously. The full duplex solution is required as it has superior performance by allowing both parties to speak at the same time with no cutting in and out of the talk path. This is quite easy to accomplish with a handset phone but not as easy to do with a hands-free phone. 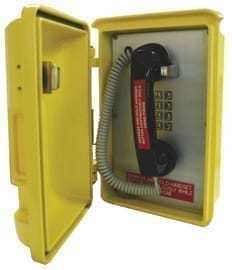 Most full duplex phones also offer noise and echo cancellation to eliminate background noise from causing interference. Increasingly transit, campus, hospital applications choose to utilize an integrated system which consolidates emergency telephones, mass notification and video surveillance. Mass notification systems provide real-time information and instructions to people in a building, area, site or installation using intelligible voice communications along with visible signals, text and graphics often including tactile or other communication methods. The purpose of a mass notification system is to protect life by indicating the existence of an emergency situation and instructing people of the necessary and appropriate response and action. A digital video surveillance system is capable of capturing images and videos which are compressed, stored or sent over a communication network. The combination and integration of emergency telephones, mass notification and video surveillance provide increased protection for public safety. VOIP offers a secure and high-quality service by managing calls over private networks. In the full duplex mode of transmission, the communication is bi-directional.